Two people escaped from their burning home this morning (Wednesday) in eastern Johnston County. The fire was reported at 2:23am at 462 Old Denning Road near Princeton. 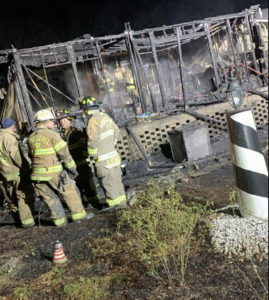 A doublewide mobile home was engulfed in flames. Both occupants were rescued by a neighbor. The fire victims were transported to the hospital for treatment. The Princeton, Pine Level and Brogden Fire Departments brought the fire under control in about 30 minutes but the 2,300 square foot doublewide mobile home was a complete loss. Johnston County Emergency Services Fire Marshal Adam Stanley said the blaze was caused by a heat lamp that most likely fell on bedding for animals on the porch. “While heat lamps provide warmth for our animals during these cold months they do present a fire hazard,” Stanley told JoCoReport. The fire marshal said homeowners should only use heat lamps with guards that may provide some protection if the lamp falls into combustible bedding. Ensure heat lamps are installed in locations where they are far enough from any combustibles to preclude ignition. Securely install heat lamps in locations where they cannot be knocked down or reached by animals. Make sure electrical circuits are not overloaded and keep all combustible materials away. Ensure the installation is secure and the light cannot be knocked down. The fire was ruled as accidental.